Andrea Scharf aka Things Dre Makes! I’m Dre - an illustrator from New York City, currently based in Vienna. I illustrate daily life with a combination of jaunty lines and humor. I love all things handmade and making people smile. My specialty is casting ordinary things in a playful light on everything and anything--from wedding stationary and textiles to custom illustrations and short animations for editorial purposes. This animation was created for a group show "Bright Minds, Dark Thoughts" where 13 artists explored the human psyche. Often times, our thoughts and feelings have the power to dictate how we experience life to such an extent that they cloud the reality of the situation at hand. We get caught up in a difficult emotion, accompanied and reinforced by a negative narrative we tell ourselves, and linger in that space. "Get Out of Your Head" invites you to get curious about and observe the nature of our thoughts and feelings. If we manage to catch ourselves before getting stuck in a negative spiral and recognize that these are just thoughts, we get a chance to melt back into our physical surroundings instead of staying stuck in our heads. "Who would I be without this thought?" This piece is about how our minds can cloud our current experience preventing us from being present and connecting with the people and space around us. 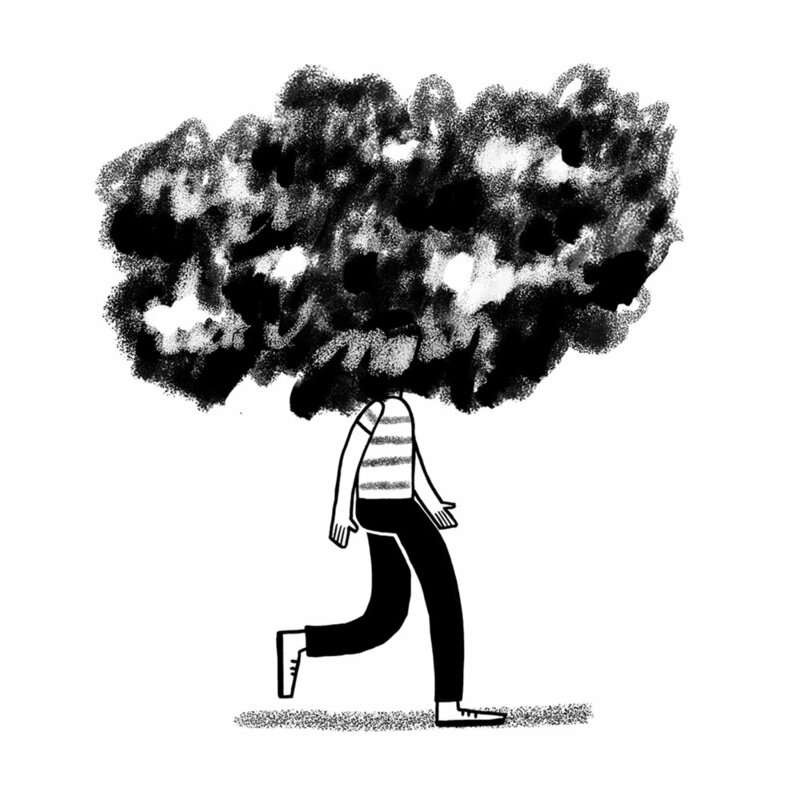 But, it's also about how, often times, we do have a choice, as to how long we stay in that cloud of thoughts. By being aware that our thoughts, are in fact, just thoughts that come and go just like mood swings do, it gives them less power and allows us to see and experience the the world outside our internal monologue. I get my ideas both from my surroundings and from my own thoughts and daydreams. I'm very lucky to be surrounded by an amazing and creative group of friends, some of who I share a studio with. That definitely helps to stay motivated and inspired. I draw my inspiration not just from the people around me but also from the mundane and absurd daily encounters that we all experience. As I'm often lost in my own thoughts when I'm on the go I jot down ideas that come to me and refine them later when I am in a more appropriate place and situation. I question and wonder about a lot of things when I'm daydreaming. Asking "why?" and "what if...?" usually leads me to an imaginative seed of an idea. In this section we interpret the work from our perspective and describe why we selected it to be featured. Get out of your head is a thoughtful artwork that reflects an attentive observation. We all get stuck with our thoughts at times. They seem to control our actions and we tread the same neural pathways over and over again. Neuroscientist David Eagleman puts it best when he says that “most of what we do and think and feel is not under our conscious control” (Incognito, p. 4). Building up capacities, however, to delibaretley leave those negative thinking spirals is one sure way to improve your creative thinking. Maybe you are just stuck with a mediocre idea and wouldn’t come up with new thoughts. Or negative feelings block you and wouldn’t allow for positive emotions and a more objective perception of your surrounding. Different techniques would help different persons and each one must figure out what works and what not. Sometimes, taking a quick shower or going for a run might be enough to free your mind and deviate your thoughts from a problem at hand. Other times journaling or meditation can feel liberating, especially when the blocking thoughts stem from a negative mood. We love Dre’s reflection by posing the question: "Who would I be without this thought?" Yeah, ask yourself. Who would you be without a particular thought? What would change? What new perspectives arise? Re-framing your situation or challenge is a great designer tool to take on fresh perspectives on otherwise fixed views. Try to apply this next time you feel stuck. Sign-up for our monthly Newsletter. 10 hand-selected updates, news, tools or events on creativity in your inbox every month (sometimes twice a month).